Blink-182‘s latest addition Matt Skiba has shared a new version of the band’s recent clip for their 2016 feels-inducing track ‘Home Is Such A Lonely Place’. The track comes from the band’s first album sans former member Tom Delonge, and the band shared a new video last month for the track from California featuring home videos and special moments of members of the band with their families. 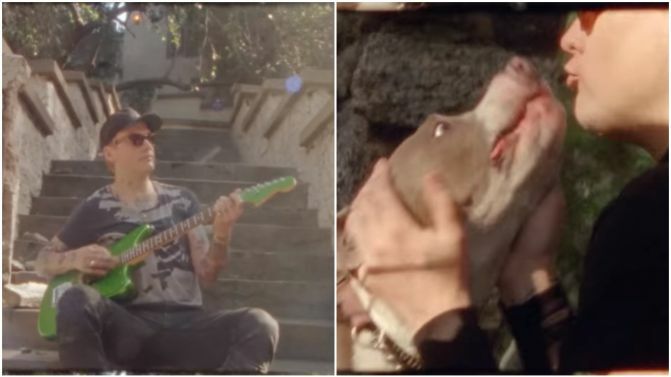 Now their newest addition, Alkaline Trio’s Skiba, has shared his own version of the clip, containing purely his own home footage and family clips (including heaps of vision of his gorgeous dog), which wraps up with the band heading out on stage to perform the track. This latest video could indicate that we’re still to see clips that focus in more closely on the home lives of other band members Mark Hoppus and Travis Barker. Check out the latest Matt Skiba-centred clip for ‘Home Is Such A Lonely Place’ below.